After a week of rest and relaxation in Quito, Dylan and I headed out through Cumbaya and Tumbaco, towns to the east of Quito, and made our way to Sangolqui. From here we headed south, the road turning into cobblestone. After 5 miles of this it was already 4 in the afternoon, and the clouds up ahead were dark. All we could see ahead was more steep cobblestone, so we decided to call it quits in Rumipamba. The only store in town was closed so we picked a house at random and knocked on the door to inquire if there was somewhere in town where we could camp, possibly with a roof, a shed or old barn perhaps, as we were sure it was going to rain. After a minute, the family we talked to said “Oh, well we have an extra house just around the corner, no one lives in it, why don’t you spend the night there”. So for a night we had a little house with running water, lights, and a radio. It didn’t actually end up raining, but it was nice nonetheless to have a place to stay like this. Next morning we were on our way, up the cobblestone, when we ran into Greg. We last saw him in Otavalo, where he ended up spending some time off. Though we discussed going the same route, we had not agreed to meet up at any given time, but knew we’d be on the same road on the same day, so were not surprised to run into him. 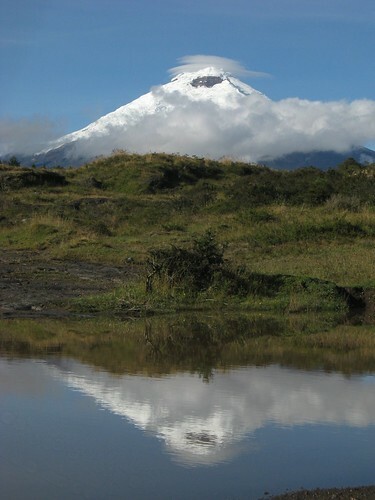 After several hours of uphill on rough road, yet only making 10 miles, we stopped for lunch at the junction that heads south oe way to Cotopaxi National Park, or east another way to Machachi, a town on the Panamerican Hwy. We still had not seen Cotopaxi as it was rather overcast, and it started raining. We could either keep going up (we were already at 11,500 feet or 3,500m) and pay $10 to go through the park and still not see the mountain, or ride 10 miles mostly downhill on cobblestone to Machachi. Either option had us getting wet and cold, and no chance to see the volcano, so we called it a day and hung out at a lodge in front of a fireplace. Our hope was that things would clear up in the morning. We slept outside in the carport of the lodge (as rooms were $24 a person), which was fine as we stayed dry and it only got down to 42 F. Falling asleep was diffcult though, I’m not used to the elevation yet. Sure enough, the next morning Cotopaxi (one of the highest active volcanoes in the world) was out, so we enjoyed the beautiful view as we made breakfast. On our way up to the park the clouds came in and we wouldn’t see Cotopaxi again, but we had a great time riding the dirt road through the treeless paramo in the park, a world away from the busy Panamerican Hwy. It would have been even more incredible if we had clear views, but it was a fun day anyway as I set a new altitude record for myself. Greg had spotted bolete mushrooms outside the park and picked some. I was a little uneasy about eating them, but Greg assured us that he had picked mushrooms for decades and knew how to recognize them. So at the 12,770 foot pass we broke out the cast iron skillet and we sliced fried up the huge mushrooms in some butter (did I mention it is cool enough to carry butter again?). Almost 24 hours later I am writing this so I guess they really were edible. We’ve made it to Latacunga, and hope to get to Baños today. Here Greg and Dylan are thinking of heading east into the Amazon basin, but I’ll most likely continue south in the mountains. Shroomin’? Haha. Hope you’re doing great! I’m really hoping this Argentina thing works out! oh I see you had someone picking that knew what he was doing…and seems like the bolete really can’t be confused for any poisonous varieties (unlike amanitas). Awesome! give it 3 days and our livers will shut down . . . but they were tasty! what a view! looks like that cast iron skillet has come up trumps again – well worth it’s weight! Hi Matt from Steph, Brendan, Elizabeth and baby Ivy! We love to read what you are doing. 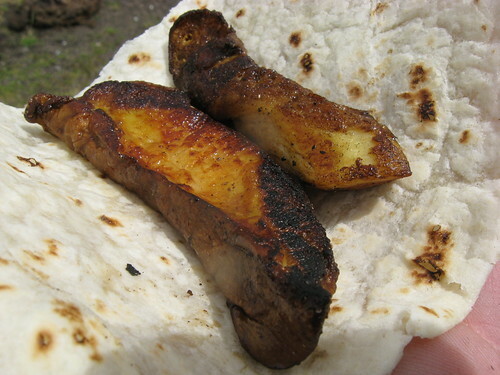 The mushrooms look amazingly good. Indeed, it’s very interesting that you were cold while we’re having 90-plus degree days! We miss you and wish you all the best!